Is there a place for Islamic law in Western countries? 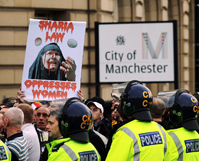 To Westerners, the Arabic word Sharia often conjures up images of amputations for Muslim thieves and stonings of adulterous women. But the term actually encompasses all Islamic religious precepts — including how to pray — and its interpretation differs from region to region. Only a few Muslim countries, including Saudi Arabia and Iran, carry out such harsh Sharia penalties today. And, some Muslim countries, such as Tunisia and Morocco, have passed progressive laws giving women equality with men — in the name of Sharia. In recent years, imams at English mosques have been adjudicating hundreds of requests from Muslim women seeking religious divorces. Critics say these Sharia tribunals constitute a parallel legal system that discriminates against women. But researchers say they mainly free women to remarry in keeping with their faith. After recent electoral gains by Islamist parties in Egypt, Morocco and Tunisia, human-rights advocates worry that new governments may reject progressive interpretations of Sharia for the harsher, Saudi- or Iranian-style versions.